Our fourth-grade teachers work hard to hone writing and other academic skills and to make sure that their students' final year in elementary school is not only memorable, but also one that prepares them well for intermediate school! Your students will love learning from this caring and dynamic team! 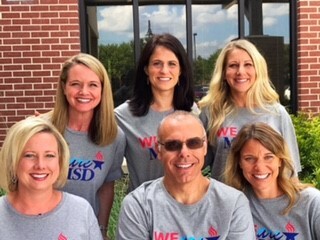 Top Row Left to Right: Lovey Turner (Language Arts / Social Studies), Lisa Gonzalez (Math / Science), Julie Williford (Language Arts / Social Studies). Bottom Row Left to Right: Laura Caldwell (Math / Science), Rob Austin (Language Arts/Social Studies, and Kelly Rudd (Math/Science).